A redstone comparator can be placed on the top of any opaque block with a solid full-height top surface (including upside-down slabs and upside-down stairs), as well as on hoppers. To place a redstone comparator, use the Place Block control. 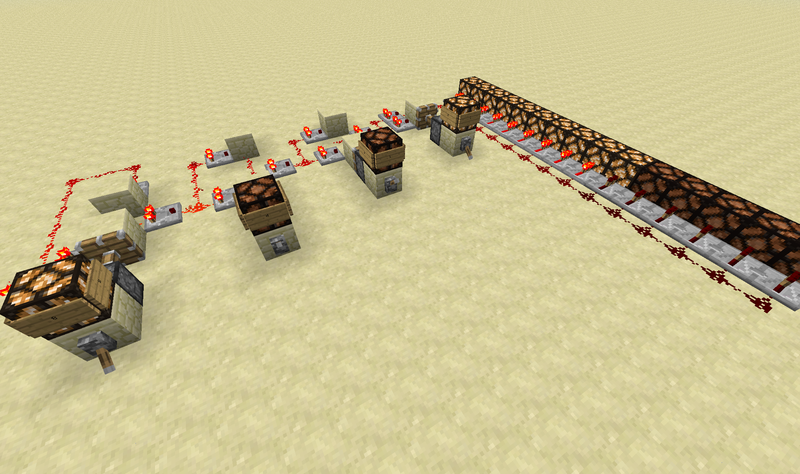 A redstone comparator with no powered side inputs will simply output the same signal strength as its rear input. A redstone comparator in comparison mode (front torch down and unpowered) will compare its rear input to its two side inputs. If either side input is greater than the rear input, the comparator output turns off. If neither side input is greater than the rear input, the comparator simply outputs the same signal strength as its rear input. A redstone comparator will treat certain blocks behind it as power sources and output a signal strength proportional to the block's state. The comparator may be separated from the measured block by a solid block. But in the Computer version, if the solid block is powered to signal strength 15 the comparator will output 15 no matter the fullness of the container due to MC-64394. When a comparator measures a large chest or large trapped chest, it measures the entire large chest (54 slots), not just the half directly behind the comparator. A chest or trapped chest which cannot be opened (either because it has an opaque block or ocelot above it) will always produce an output of 0 no matter how many items are in the container. The Minimum Items for Container Signal Strength table (right) shows the minimum number of 64-stackable items required to produce specific signal strengths from various containers. A number followed by an "s" indicates the number of full item stacks required (not displayed if a full stack is not required), and a number followed by an "i" indicates the number of additional items required (not displayed if no items are required beyond some number of item stacks). For items which stack up to a maximum of 16 (snowballs, signs, ender pearls, etc. ), divide the "i" number by 4 and round up. For non-stackable items, count any "i" number as one additional item. For example, to produce a signal strength of 10 from a hopper requires a minimum of 3 full stacks plus 14 more items (or 4 16-stackable items). A comparator can measure the state of an item frame's contents. In order for a comparator to measure an item frame's contents, it must be placed behind the block the item frame is attached to, facing away from the item frame. An item frame comparator will output 0 if the item frame is empty, or 1 to 8 for any item depending on its rotation (1 at initial placement, plus 1 for each right-click rotation to a maximum of 8, then wrapping back to 1). A jukebox outputs a signal strength which indicates which record is currently playing. For which records produce which signal strengths, see the Minimum Items for Container Signal Strength table above. A redstone comparator has a block entity associated with it that holds additional data about the block. The redstone comparator's block entity ID is comparator. Added delay of 1 game tick (1/2 redstone tick) to comparator to fix bugs. Blocks 149 (unpowered_comparator) and 150 (powered_comparator) were removed from the /give command. Issues relating to “Redstone Comparator” are maintained on the issue tracker. Report issues there.